Grass Roots can provide for all your maintenance needs. Mulching, shrub and tree pruning, weeding, tree work of any kind, pest management, grading and lawn renovation are just a few of the maintenance services we offer. If it pertains to your outdoor living space, we can help you. Our employees are well versed in proper practices for everything we do, and receive additional training regularly. Services are available on a one time basis or we can custom tailor a maintenance contract to your exact needs and provide a convenient payment schedule that helps budget your expense throughout the year. Whether you need a simple one hour job completed, or require someone on site every day, Grass Roots Landscaping, Inc. has courteous, timely, and well trained employees that will make it happen. Grass Roots provides full service lawn care. Our mowing crew uses equipment that is maintained daily, ensuring you get a quality cut every time. One-time service is not available, but join our regular route, and we’ll monitor your lawn and keep it looking its best. Imagine spending hours of free time enjoying your lawn, not cutting it! Pricing starts at $30.00 per service visit and varies depending on size and complexity of lawn areas. Grass Roots Landscaping, Inc. has licensed and trained applicators and technicians to apply all products and provides notification upon arrival so you know what is applied when.These services are available individually, but the 4 seasons package is available only through pre-payment. This allows us to buy the materials in bulk and pass the savings on to you. Contact us for pricing on your property. These services can also be bundled with mowing and or landscape maintenance in a contract with convenient monthly payments. 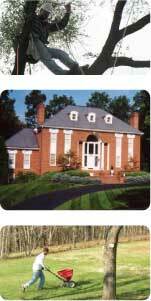 Grass Roots Landscaping services the Shenandoah Valley and areas of Virginia including, and not limited to: Harrisonburg VA 22801 22802 22803, Bridgewater VA 22812, Rockingham County VA 22821 22812 24471 22840 22841, Elkton 22827, Augusta VA 24441, New Market and Shenandoah VA 22844, Timberville VA 22853, Weyers Cave VA 24486, Broadway VA 22815.